A logo is more than a pretty picture. To the public, logos serve as an instant reminder of a company or product, what they represent and the values they stand for. The challenge is embodying all of that into one single graphic. More logo designs than ever are popping up, and in that comes the challenge of making yours original, and standing out in a sea of identities. In this blog we’ll look at some of the fundamentals in designing that perfect logo. Logos must be simple, yet memorable. Your logo should be able to make a statement and stick in a person’s mind. This way the next time a customer needs your kind of business he’ll choose you just because of brand recognition. If there’s too much text, contrasting colours and offensive images your brand will get lost in all the chaos and your business forgotten about. Think about how simple the Mc Donald’s logo is. An uncomplicated golden arch, and yet possibly the most recognised logo of them all. Take time to think about your colour choice. When considering a brands personality, colour is possibly one of the most important factors. Every colour has a different implication, do some research into colour connotations and what different colours represent. Red stands for passion, love and danger and would be good for a dating website, where as gold represents luxury and lavishness and could be used for a perfume brand. Be versatile. Your logo should work across many mediums; it will be used on your social media sites, letterheads, websites and many more documents. Consider this when designing. A bright and bold colour scheme may look fantastic on a computer screen but think of the printing costs if you’re sending out a lot of leaflets and letters. Avoid the clichés, and be unique when thinking of potential ideas. A car for a driving school, nail polishes for a beauty parlour. These ideas are often the first that pop into your head in the initial stage of designing a logo, and for the same reason should be the first ideas to discard. Logos don’t have to be completely obvious as to what you do as a company, take Apple for example, perhaps one of the biggest computer company’s in the world, and yet there isn’t a computer insight on their logo. However the Apple logo is derived from the story of Adam & Eve in the bible, the bitten apple represents the fruit from the “tree of knowledge,” so the logo does make a statement about Apple as a brand. A logo needs to be timeless, if you really want your brand to stick around your logo should stand the test of time. Avoid following trends as they will more than likely go out of fashion, remember less is more. 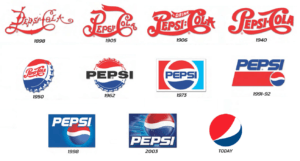 One brand who does this really well is Coca Cola, their logo design has barely changed since 1885, unlike its competitor Pepsi who has had many restyles. A logo is the face of your company. When you’re on holiday in a strange foreign country there’s always something weirdly comforting when you see those Golden Arches, because you know and trust Mc Donalds as a brand. Take time to develop your logo, stand out from your competitors and decide what values and ideologies you stand for. Next Post The Digital Doctor: The etiquette of Twitter, a businesses guide.